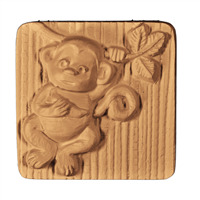 An adorable monkey hangs with one hand on a long vine while carrying a banana in this soap mold design. The backdrop to the monkey is textured bamboo in a square shaped cavity. Bar Depth: 1.5" Bar Length: 2.75"
The Three Wise Monkeys of “See no evil, hear no evil, speak no evil” proverb fame are based on a Japanese Shinto shrine that incorporates Chinese Taoism and Confucius’s Code of Conduct. 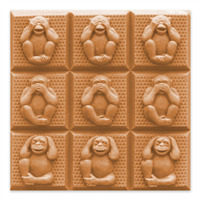 The Three Wise Monkeys Soap Mold depicts these mystic apes in their classic poses and will remind you to keep things positive. 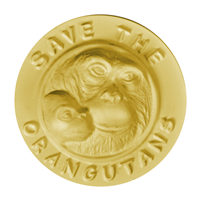 Bar Dimensions: 2.625" x 2.625" x 1.375"
Make a statement with our Save The Orangutan Soap Mold. It is the perfect soap mold for Palm-Free Soapers and animal lovers! This round bar mold has a mama and a baby orangutan in the center surrounded by "SAVE THE ORANGUTANS." Bar Depth: 1.25" Bar Length: 3"